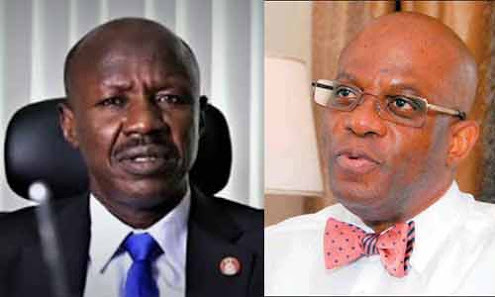 Nigerian Bar Association (NBA) president Paul Usoro has said he would not resign his position despite the pending fraud case against him by the anti-corruption agency. The EFCC, last week, filed an alleged N1.4 billion fraud charge against Usoro before the Federal High Court in Lagos. It was announced that Usoro will be arraigned today. But, addressing reporters in Abuja at the weekend, the NBA president said he would remain in office despite attempt to force him to quit. Usoro, who said he was presenting the communique of the just held NBA National Executive Committee (NBA) meeting, assured that he would attend court today, when the case against him is fixed for hearing. Saying he has not been served with the charge, the NBA President added that he was not comfortable about the leakage of the charge against him to the media. Usoro, who addressed the news conference alone, did not dispute the existence of the charge against him. He said he is innocent and that the case is intended to force him out of office. The NBA president, in a reaction to the question whether he will resign in view of the charge against him, said: “I will not resign. No, I am not in doubt that a charge has been filed against me. I only said, in my earlier statement, that I have not been served with the charge. I do not doubt the existence of the charge. “This matter was presented before the National Executive Committee (NEC) of the NBA and we had a very successful meeting. And nobody raised the issue as regard whether I should leave. “I have already made it quite clear, if you have read my statement on what my position is as far as this matter is concerned. The National Executive Committee adopted that my address, as far as that matter is concerned, and they believed that that matter is rested. “You see, I have seen it happened a number of times, and I believe all of you have also seen it happened, that some of these incidents are hyped up simply to drive people out of office. You are aware of that. And this has happened, not once, not twice. “We have seen it happened in the case of the Senate President (Bukola Saraki). Ultimately, what happened? The Senate President was absolved of any criminality. What would have happened assuming the Senate President had resigned? “We have also seen it happened and somebody was hounded that way, and he resigned. And at the end, he was found not to have done it. It is also very possible that in this particular instance, that was what the people wanted and that was why that was that hype. All of you are aware of it that there were plenty of leakages in regard to this matter, just before the NEC meeting. “I am personally convinced that the reason why there was so much of the leakage was to instigate NEC possibly to get me out of office. Well, that did not succeed. So, we went to NEC and I presented the things that we want to do as the national officers are concerned. NEC is quite happy with it. “The lawyers are very happy with it. And we are focused on delivering those things that we want to do as far as the NBA is concerned. We will continue to do those things that would elevate the welfare and the essence of our lawyers, as well as promoting and preserving the rule of law. And that is what we will continue to do,” Usoro said. Hey Buddy!, I found this information for you: "Why I Won’t Resign Over EFCC N1.4bn Case – NBA President". Here is the website link: https://headlinenews365.com/why-i-wont-resign-over-efcc-n1-4bn-case-nba-president/. Thank you.